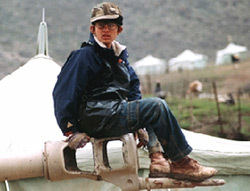 It's March 2003 in Northern Iraq, and 13-year-old orphan Soran (Soran Ebrahim) is thoroughly enjoying the sway he holds among his neighboring cluster of Kurdish villages as the only local who knows how to acquire and install satellite dishes to bring news (which he also pretends to translate) of the impending American invasion. Known to everyone by the nickname "Satellite," the boy has a curiously endearing cockiness that only partially masks the kind of youthful angst that's unavoidable for a kid with crooked teeth and cockeyed glasses. He's strong-willed and industrious -- employing and supporting the village children, whom he plays at bossing around as they dig up and dismantle land mines to sell in the underground arms market. But ultimately he's still 13 years old, which is why he becomes obsessed with a quiet, outwardly impassive, inwardly haunted orphan girl from the refugee camp that has sprung up nearby. The third feature by Iranian filmmaker Bahman Ghobadi ("Marooned in Iraq," "A Time for Drunken Horses"), "Turtles Can Fly" is a tragic yet bittersweet, simple yet spellbinding slice of life's uncertainty. Set in a rugged, wind-swept desert mountain region where the coming war is only the latest challenge to Kurdish fortitude, the film envelops you completely in Satellite's scrappy existence among tent villages, mud houses, rusted-out tank wreckage and scrap-metal artillery shells. But even more significantly, it captures the war-torn psyches of its young characters -- none more so than the girl Satellite clumsily woos (Avaz Latif), who is led toward catastrophe by traumatizing flashbacks of an Iraqi attack on her village that left her emotionally scarred, left her seemingly clairvoyant brother without arms, and saddled them both with caring for a half-blind 3-year-old. The ingenuous performances of these non-professional actors have a poignant earnestness that Bahman uses to blow cold breezes of visceral melancholy through the desolate landscape of "Turtles Can Fly." Yet at the same time the film has a humanity, humor and hope that springs from Satellite's small-scale entrepreneurial perseverance. A few of the peripheral characters -- mostly other children -- don't seem to have the same knack for being unaffected before the camera, but this is an insignificant quibble. It's not like Bahman could hold auditions for five-line roles in this remote locale. Regardless, "Turtles Can Fly" masterfully personifies the practiced endurance of the Kurdish people in the face of calamity, and brings into sharp relief a pivotal moment in history from an oft-forgotten perspective. It is an unpretentious, understated tour de force of Middle Eastern cinema.